THRISSUR, India (CNS) — The Catholic Church in Pakistan has presented a series of demands to the government, calling for a fair and thorough investigation into the beatings and burning of a young Christian couple accused of desecrating the Quran. In a so-called Charter of Demands sent to top government officials Nov. 17, church leaders said they were seeking to curb the misuse of Pakistan’s blasphemy law against religious minorities. The charter also urges the government to act on the misuse of mosques to incite violence and calls for training police to protect victims of violence. 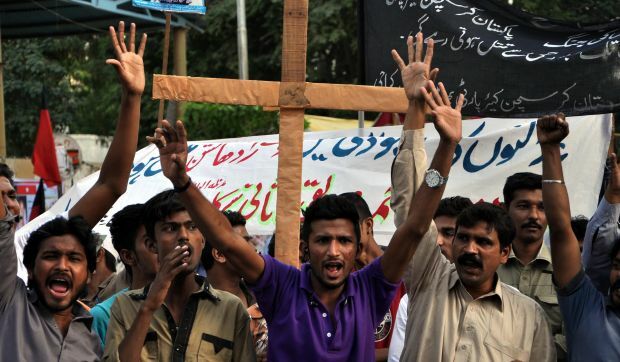 “The brutal burning to death of a Christian couple working as bonded labor at the brick kiln is a grim reminder that intolerance in the name of religion in Pakistan has escalated beyond rule of law,” said the document submitted by Archbishop Joseph Coutts of Karachi, president of Pakistan Catholic Bishops’ Conference. “The situation has now reached beyond the application of laws for justice … crowds and police are repeatedly setting precedents for street justice, which violates the constitution,” said the document, which was sent to President Mamnoon Hussain, Prime Minister Nawaz Sharif and Supreme Court Chief Justice Nasir-ul-Mulk. The Major Superiors Leadership Conference, representing Catholic religious communities in Pakistan, also signed the charter. A mob estimated at more than 1,000 people tortured and burned alive Shahzad Masih, 28, and his pregnant wife, Shama Bibi, 24, parents of three young children, Nov. 4 at the brick kiln where they worked in Punjab province. Police said the size of the crowd prevented them from protecting the couple. Meanwhile, Peter Jacob, a freelance journalist who was the former executive director of the Catholic Church’s National Commission for Justice and Peace, reported that members of religious minorities accounted for nearly half of the more than 1,400 people accused of blasphemy since 1987. The total included 501 Ahmadi Muslims, 182 Christians and 26 Hindus. Religious minorities make up less than 4 percent of Pakistan’s population of 182 million. Jacob reported in The News daily Nov. 13 that of the 60 people killed on blasphemy allegations since 1990, 32 were religious minorities and 28 were Muslims. In 20 of those incidents, people were attacked while in police custody or killed by police while 19 were killed in mob attacks, the story said.